On a recent trip to Athens for a UGA football game, we pop into Ted’s for a post-game meal with our solo offspring. So do a lot of other people, which makes the line go out the door. We decide to stick it out, and we are glad we did. You order at the counter and the person who takes your order gets your drinks. This slows things down a bit, but they do have two lines going today because of the game. After about 15 minutes, we get to the head of the class. Ted’s features stone-baked pizzas in a large oven. You can get sandwiches as well, but we have to try that oven. And that means pizza for the three of us. 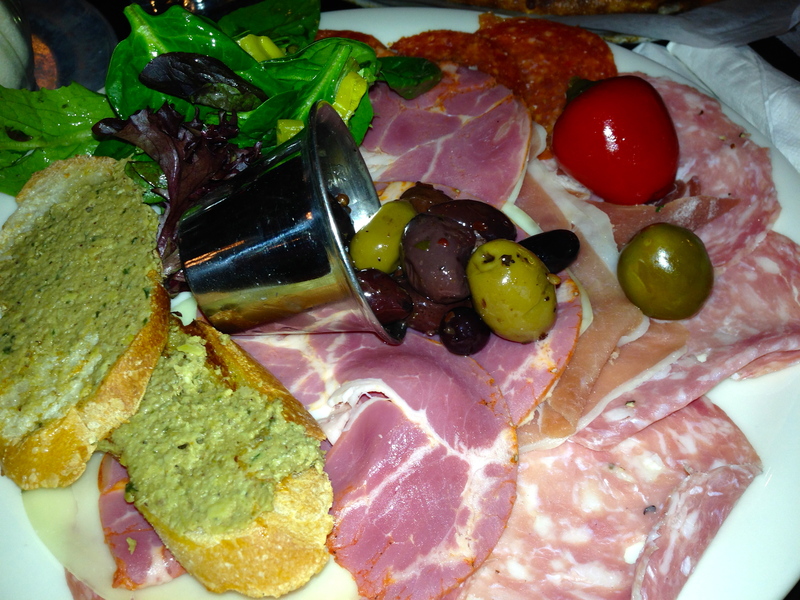 But first, take a look at the antipasto plate. This is quite good. The meats are excellent and high quality, especially rolled up in the cheese that’s underneath them. The olives are spicy. The crostini has a liver pate on top that is tasty. 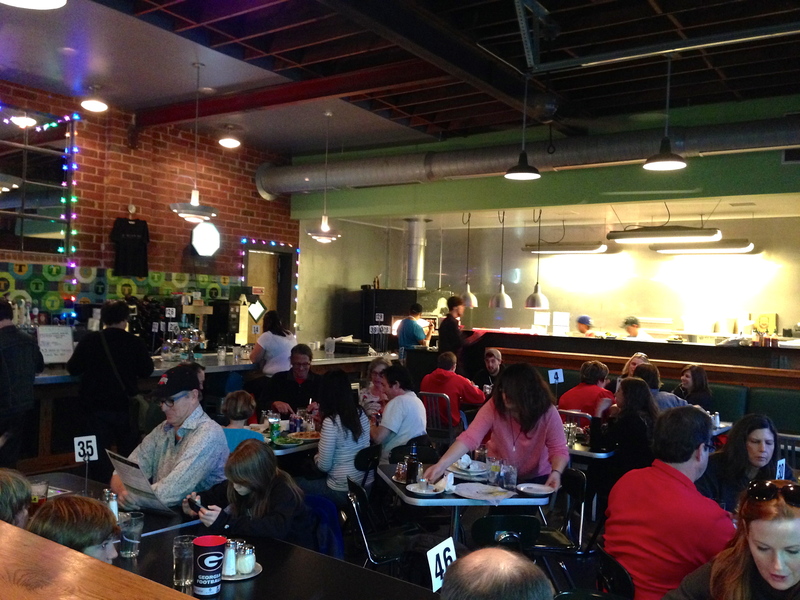 Because the place is packed, we are expecting a long wait for the food, but our pizzas are delivered in much less time than we waited on line. That oven must cook very quickly. I get the bacon and egg pizza. 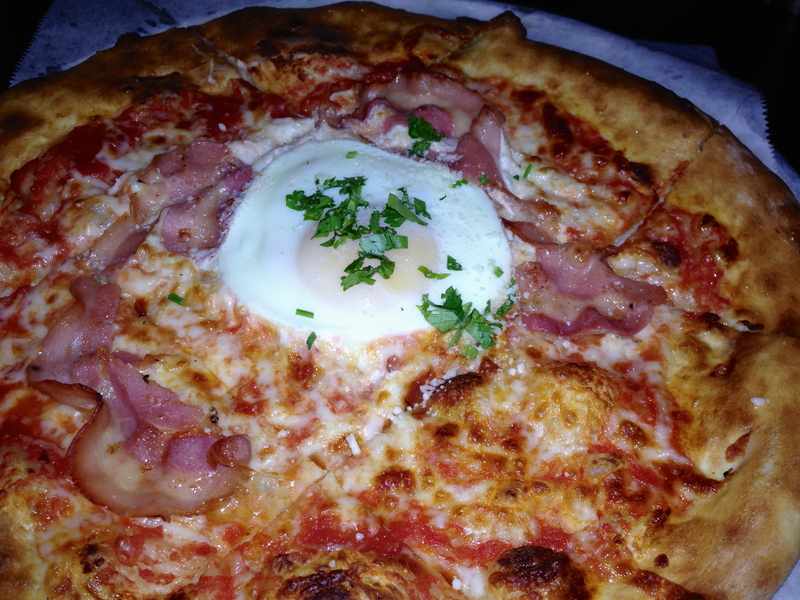 Yes, there is an egg in the middle of the pizza. The “bacon” is pancetta, which adds a lot of saltiness to the pizza. I break the yolk and make a yummy, gooey mess in the middle of my pie. Eve goes for the daily special. 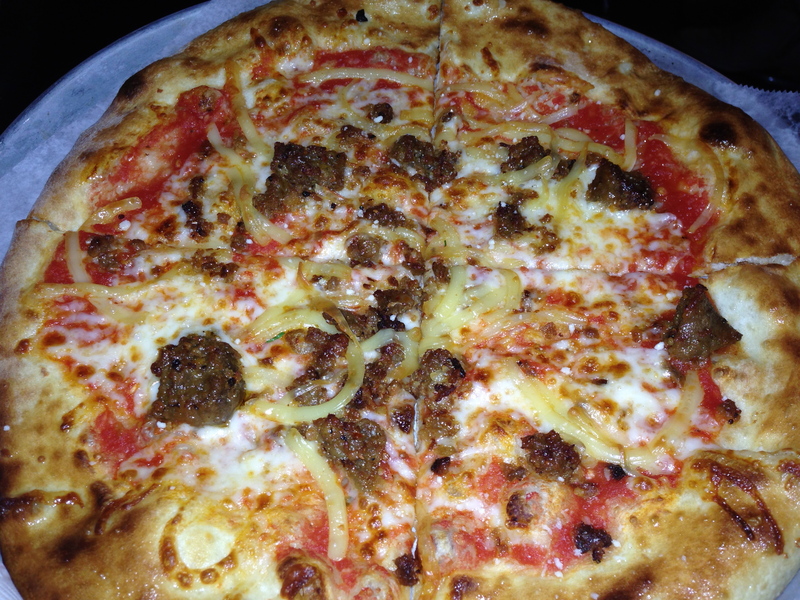 Spicy sausage and gouda cheese top this pizza. It is supposed to have jalapeño peppers on it as well, but she wisely omits those as the pizza is spicy enough without them. Elliott orders the White Rabbit pizza. If you “go ask Alice”, (extra points if you get the Jefferson Airplane reference), she will tell you that a béchamel sauce tops the pizza as do arugula, artichokes, onions and peppers. 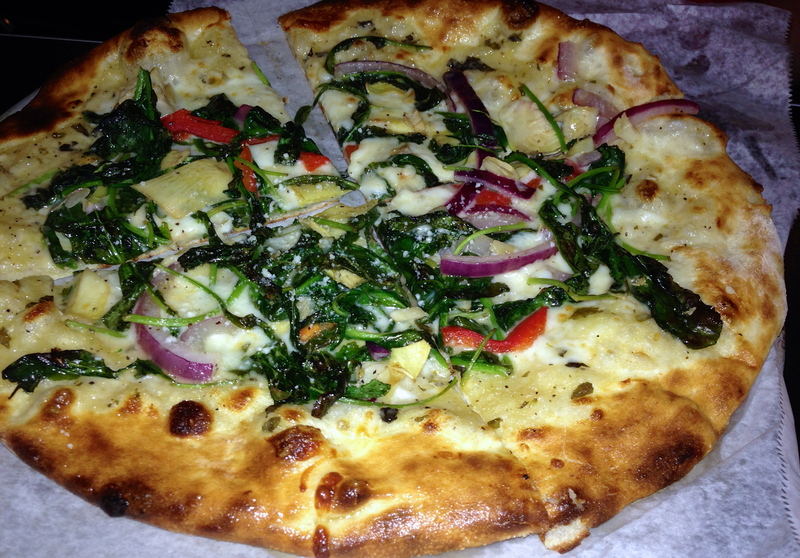 With all of those onions and peppers, don’t eat this pizza if you are on a date! Ted’s is tasty. It’s a worthy addition to the Athens pizza scene.